It has been said that necessity is the mother of invention. Out of desperation, I created some cute kitchen cabinet organizers for almost free using common items from around the house. Chaos may seem like a strong word to describe my kitchen cabinets. You know the feeling. You’re cooking dinner and need one more herb or spice and before you know it, you’ve pulled out half of the little bottles looking for the RIGHT one! The counter is covered in seasoning containers while you hurry to pull together the dinner recipe and get it on the table before everyone starves to death. You may already be suffering from near starvation yourself. At least, it feels like it as you’re overcome by all those wonderful cooking aromas. Frankly, I was tired of having a jumble of seasonings in my cupboard. Sure, I would line them up or organize them in some fashion. And then it was dinnertime and BAM! chaos took over my seasonings shelf. I confiscated a few existing oblong drawer organizers that were, yes, in a drawer. Which I freed by simply condensing the contents of the remaining plastic trays. They are perfect for holding a line of herbs and spices in my kitchen cabinet. Once I realized they would work so well, I wanted to make them even more practical with labels and dress them up a bit, too. Using wood ovals that were leftover from making coastal Christmas ornaments, some turquoise craft paint, a white paint pen, and a couple dabs of E6000 glue , I added charm, color, and a helpful label to each organizer. My kitchen organizing frenzy did not stop there. I had another problem area I wanted to address. My teas. Tea boxes are lightweight, they have slippery coverings and must be corralled or they come careening out of the cupboard whenever I go searching for my favorite tea of the moment. I have a small stash of recyclables in my “studio.” A little bit of everything from jars, to various boxes, to frosting containers, and yes, the ubiquitous cardboard rolls. After depositing a variety of boxes on my countertop and testing out their sizes, I realized that rectangular tissue boxes would easily hold three tea boxes. Win!! 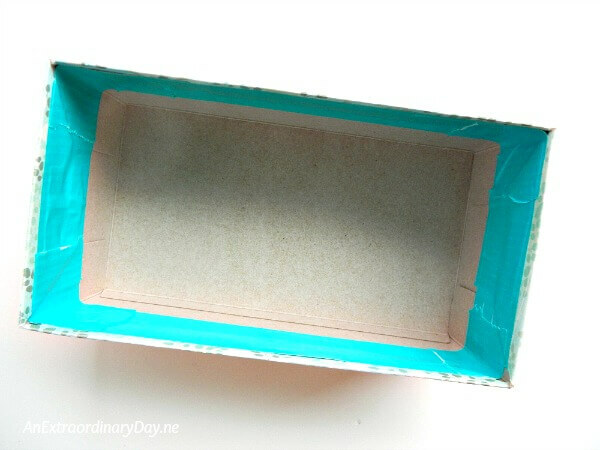 How did I transform a tissue box into a kitchen organizer for tea boxes? It’s so easy and again, nearly free. Label (optional) I used unfinished wood “T” letters which I painted white. Cut the top of the box at each of the corners so you have four flaps to turn down. If your box has plastic at the opening, carefully remove the plastic. Place a bead of glue on the inside of the flap and adhere to the inside wall of the box. Glue fold and attach tape one side at a time. Go back and add tape to the corners to finish them off for a more polished look. Add a label if you wish so everyone knows there are tea boxes in your tissue boxes turned kitchen cabinet organizers. I simply used the letter “T” and glued it to the box with my Tacky Glue. It was a fun way to identify the box contents and a little tongue in check. We absolutely LOVE how much neater our cupboard is with our cute “T” organizers. My husband makes me a cup of tea nearly every evening before bedtime and I no longer hear tea boxes bouncing around on the kitchen counter. Yay! If you like the idea, but want to color-coordinate your cabinets, purchase tissue boxes in colors or patterns you love. This time of year, we go through lots of tissues, so it doesn’t take long to collect “tea” box organizers for our kitchen cabinets. My organizing didn’t end with that cabinet in my kitchen, I took it to the counter just below. Some time ago I picked up some cake tins at the thrift store. They were cheap, and not of the quality you would want to use to bake a cake. I used one in the set to make a super cute and useful desktop organizer but had two more left over. I transformed one of the cake tins by painting it the same color as the seasoning labels and added a pretty paper that I Modge Podged to the bottom to create a fabulous small kitchen organizing tray. You know how I LOVE mason jars. I decided to use one of the extras I had leftover from this Mother Day mason jar project to hold some of my kitchen utensils. Because it wouldn’t hold everything I wanted to have handy on the countertop, I painted a large soup can to match for the shorter handled utensils. When I was organizing my spices I realized I had an empty spice jar that was at the back of the cabinet, just waiting to be used again. So I cleaned and dried it well and added my Himalayan salt to the jar. It came from a larger container that I’ll be using in an upcoming project. It really was too large to use on the table, but we did. This is a much nicer option. For fun, and to give everything a themed feel, I added a strip of washi tape to the ring of the mason jar, a couple more strips to the painted tin can, and two more strips to the salt shaker. I love having all of it so close at hand and it’s a fun and colorful addition to my kitchen, too! There’s a little extra room on the tray, so I might add my olive oil bottle which is tall and white, to the back of the little tray. This was a cute and low-cost solution for organizing my kitchen cabinets. Are you a kitchen organizer or do you have a problem spot in your kitchen? Mary Beth, from Cupcakes and Crinoline, shares a creative idea for organizing kitchen staples in an unconventional way with items you throw away. She’s so clever! And, Jennifer, from Celebrating Everyday Life, shares how to make a kitchen coffee and cocoa station from nothing. So cute! It an exciting adventure, thinking outside the box, to organize and decorate our homes with what’s leftover and maybe even considered trash. Who knows what we’ll create. Whatever it is… we’re going to have fun sharing how you, too, can Make Something From Nothing. I hope you’ll plan to join us! Oh Diane! I love these tips so much!! I agree, sometimes I make a bigger mess looking for something because I have to pull out so much – your spice catalog would make things so much simpler. Like you my tea storage needs some major updating! And your jar ideas are right up my mason-jar-loving alley 🙂 I am looking forward to giving this a try! Thank you for sharing so many GREAT ideas!! I Love all your kitchen organizing ideas Diane! Just this weekend I was thinking of using some extra drawer organizers for my spice jars and I will use your idea of using an empty spice jar for my Himalayan salt that I too have in a larger container and this will just make it so much easier to use…. Love your creative use for your Mason Jars; I too love them for their look and versatile functionality! I’m thrilled, Debbi, that this post meshed with your own organizing inspiration. It’s so fun to get things organized and hopefully pretty, too. And YAY! that you can use my salt shaker idea, too! Funny how we keep using those big containers when we really don’t like them at all. LOL Have fun getting organized and have a blessed weekend! Hi Diane! I just sent this post to my sister who recently downsized to an apartment after many years of home ownership. I know it will inspire her. For myself, why have I never thought to reuse those lovely spice bottles I save for small amounts of special salts? I’m going to work on that this week — and –see what else I might be dragging from the pantry for just a teaspoon. Thanks for sharing your creativity in such beautiful and practical ways. Your sister is in the midst of many challenges, downsizing, it takes an entirely new mindset to live in a smaller space after so many years in her home. I hope this post does inspire her. This looks great! I like how you used the small baskets to organize. The tray looks the perfect size yet looks like decor. You’re so talented. Thank you, Gwen! I think of the many ways I’ve attempted to organize things over the year and I’m pretty sure that these little baskets rank at the top! They really work and allow me to use “the whole” shelf. WIN!! Spring cleaning those kitchen cabinets and the pantry — thanks so much for your creative ideas, Diane! Thankfully, we were coming to the end of several tissue boxes! I am so happy to have coralled things that were just the jumble I was used to. You are so welcome, Elaine! Isn’t it crazy how we put up with a jumble? So glad you were able to get organized and coral that craziness. Tissue boxes truly make incredible organizers and they hold up surprisingly well, too. Elaine, would you let me know if this reply comes highlighted in yellow “warnings” again? I hope I finally found my fix. Thanks soooo much!